Many people who are relatively new to bow hunting and archery, and who want to know how to further hone their skills, pick up squirrel hunting. Branching out to animals is the natural next step after some good practice at shooting targets. After all, hunting animals provides a bit more of a challenge, but also an instinctual reward: food. This article guides readers through the steps to take for hunting the first several squirrels. In addition, the article suggests the Samick Sage recurve bow as the optimal bow and arrow to use. 1 Why Bow Hunt Squirrels? Hunting with a bow is a very silent activity, and hunters can reuse arrows. This makes hunting with bow and arrow ideal for the very avid hunter. Before the season starts, hunters must get their small game license and read the material found in the pamphlet. Doing so will ensure that no laws are accidentally or unintentionally broken. These regulations can change from year to year, such as bag limits and season dates. Hunters want to ensure that they are hunting ethically and responsibly at all times. Squirrels are a great animal to hunt, especially if the hunter does not feel fully prepared to hunt big game, like deer. For one, squirrels are very plentiful and hunters can find them almost anywhere. And no, these are not the typical squirrels that somebody sees in a parking lot. These squirrels live in the woods. Finally, squirrels taste alright, very similar in fact, to dark meat from a chicken. Hunters can make soups and squirrel “wings,” which is a rewarding field-to-table adventure. Hunting a squirrel with a bow and arrow is a fairly simple thing to do, but it comes with some intuition and observation. The first thing hunters should know is what squirrels like to eat. Food sources are always changing depending on the time of year. And, depending on where the hunter is located geographically, the squirrels will be eating different things. In the Midwest, for instance, squirrels prefer hickory, both the shagbark (small nut) and shellbark (large nut). 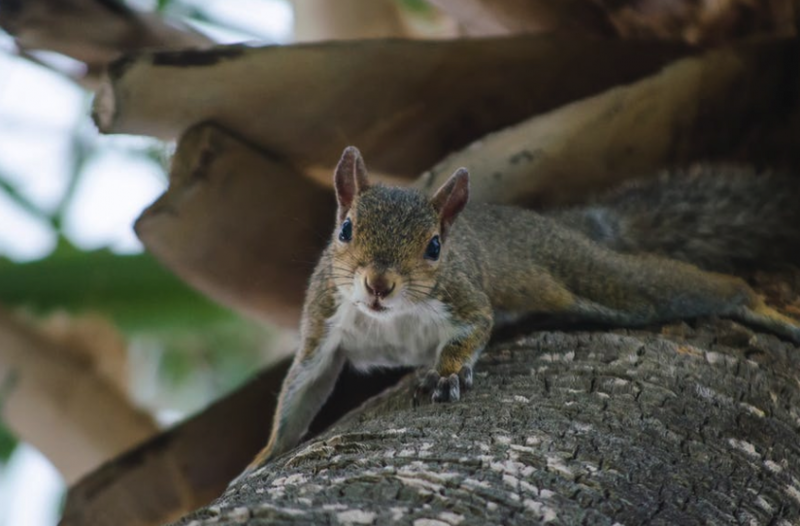 Deciding to hunt in areas where squirrels are naturally prone to go will only increase the hunter’s chances of successfully arrowing a squirrel. The next thing a hunter should do is go into the woods to find some squirrels. If the hunter is hunting in early autumn, most squirrels will still be up in the trees. It is best to keep a keen ear and follow the sound of nut shavings as they drop from the trees. Sometimes a squirrel will come part way down the tree. If not, the hunter will have to give his or her best aim, and be prepared to lose a couple arrows. If it is mid to late fall, squirrels will start to be on the ground. This is because the leaves are changing and trees are preparing for winter. Dry leaves are especially helpful for finding squirrels, but if the ground is moist, a hunter’s eyesight is critical to successfully arrowing some squirrels. Catching sight of the squirrel before the squirrel sees the hunter is literally a game changer. Finally, bow hunters must be prepared to be very patient. Depending on the weather, squirrels may not even be out and about. Not to mention, waiting until just the right moment to release the arrow is oftentimes the most critical part of successfully hitting the squirrel. Hunters must always hunt when the game is in season. The squirrel hunting season is relatively long. Sometimes, the season is year-round. Compared to only several weeks of deer hunting, this provides more opportunity to bow hunt than one could ever use up. With pretty liberal bag limits, a hunter can easily max out just from their own exhaustion. This is yet another reason why hunters like to hunt squirrels. The opportunity to practice and further hone the skill is unmatched. Once a hunter knows the season dates, it is best to pick a day with good weather. Some hunters may find more success on windy days because it is more difficult for the squirrel to hear through the wind. Other hunters find that squirrels are tucked away in their dens, and they do not have the patience to wait for the squirrels to come out. Once the hunter gets to know his or her own preference (for instance, can the hunter wait patiently for hours on end, or would the hunter much prefer a quick couple of hours in the woods), hunting squirrels becomes much more intuitive. In general, squirrels are out and about in the early morning hours, or later in the day. Listen for cutting, which is the sound that squirrels make when they are eating. Camouflage the head and hands because squirrels have very good eyesight. Consider investing in a squirrel caller. Move as little as possible, and when moving, move as slowly as possible. Squirrels are prey animals, so they are very in tune with their surroundings. Moving as slowly as possible, and as little as possible, is called still-hunting. This is a great tactic for allowing squirrels to get within range, but another strategy is to stalk. 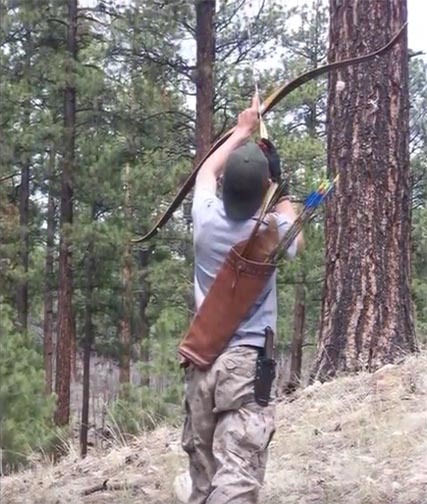 This is when a hunter spots a squirrel, and then sneaks quietly into range. Knowing where to aim on a squirrel is also critical not only for ethical hunting practices, but also for preserving the meat. Therefore, hunters want to aim for the head. This is generally more difficult, but will help both the hunter and the squirrel. Sometimes, squirrels shot in the stomach, or other areas, will be able to run around and bury themselves before the hunter can get to the target. There are several types of bows that hunters will want to use. The compound, recurve, and the long bow are all great bows for hunting small game. The recurve bow, such as the Samick Sage Recurve Bow, is a great choice for both the hunter who is already hunting year-round, and for the new hunter still in training. As for arrows, hunters want to opt for flu-flu arrows. These are great for shooting in the up direction, which will more than likely be the case for hunting squirrels. These arrows also typically do not go too far when the hunter misses the target. That being said, the hunter should always be aware of his or her surroundings, and other people. Fiberglass arrows are more expensive, but are the better choice over aluminum. If not accessible, hunters can also be very happy with wooden arrow shafts. Some good arrow tips include blunts and judos. Really, any non-skid field point is highly effective, as the arrow will not shoot through the squirrel. Hunters will find a “stun-stick” to be very effective. If the squirrel does not immediately die upon getting shot, the stun-stick allows the hunter to finish off the squirrel very quickly. Hunters keep the stun-stick, which is just a foot long in length, snapped into a belt. A good backpack for bow hunting is an option to consider, since they’re made of materials that are quiet and fit for sneaking. Finally, hunters should invest in a good pair of sunglasses. Looking up through the trees can make it difficult to spot squirrels against the glare of the sun. As with any outdoor activity, it is always good to bring some water and snacks, though hunters should be mindful of properly disposing of any garbage. 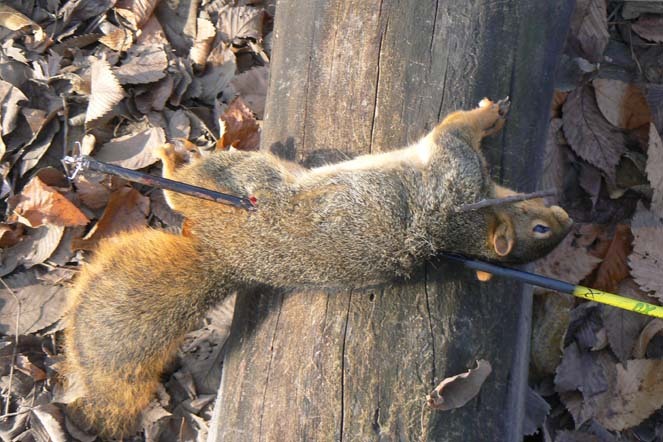 Squirrel hunting with a bow and arrow can be a very rewarding experience. Not only does it take archery to the next level, but it can stimulate the more natural instincts of those who decide to partake. 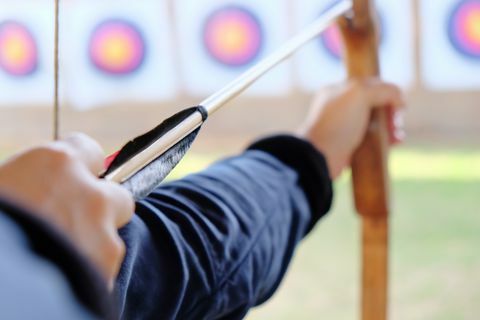 Becoming an experienced bow hunter just takes time and practice, and hunting squirrels is a great way to begin the hobby of hunting with a bow and arrow. The next step is to get the license, pick a day, and try for some squirrels. Who knows. Maybe the next dinner meal will be a tasty squirrel stew. 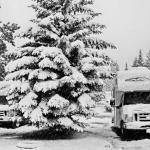 De-Winterizing Your RV? Sure, No Problem!